Summer is coming up and I'm ready to start grilling! But while everyone is talking about grilling steaks, I'm ready to start grilling pizza. I learned that you can actually grill a pizza in an outdoor oven just by accident as I was researching some stuff for wood fired pizza ovens. I first learned that there was a product called KettlePizza, but that it required you have a coal-fired kettle grill. You know, those standard ball-shaped coal grills that Weber Sells? Well, I didn't have one of those. But KettlePizza also makes a version for the gas grill. Awesome. It works on your standard 3-burner grill (or larger), and that's exactly what I have at my house. So I bought the KettlePizza gas, and have been testing it for a few weeks now. In my KettlePizza Gas review I'll talk about the main features of the device, how it works, the quality of the pizzas it produces, and how it compares to similar products. Here's my KettlePizza after a few pizza sessions (about 10). I was so excited to test it out that I forgot to take the “brand new” shots. You can see that I've already got some melted cheese baked onto the metal and the pizza stone (included with the kit) is already getting some black spots on it. That's OK though – it's bound to happen when you're cooking bread and cheese at 700º. No worries, it won't affect the flavor of the pizza or the function of the device. Note: You can order the KettlePizza Gas Pro as two different kits. The BASIC kit comes with a pizza stone and the gloves you see in the photo. The DELUXE kit comes with a wooden pizza peel in addition to the other items already listed. I wanted to get a metal peel so I got the basic kit, with a separate peel. The deluxe kit costs about $10 more than the basic kit. The “pro” is just the name of the product, e.g. KettlePizza Gas Pro. There is no “pro” version. That was a bit confusing to me when I was doing my research! The built-in handle is great for carrying the KettlePizza. Taking it to your friend's house for a barbecue is easy. Carry it like a briefcase! ==> Get the KettlePizza Gas Here! 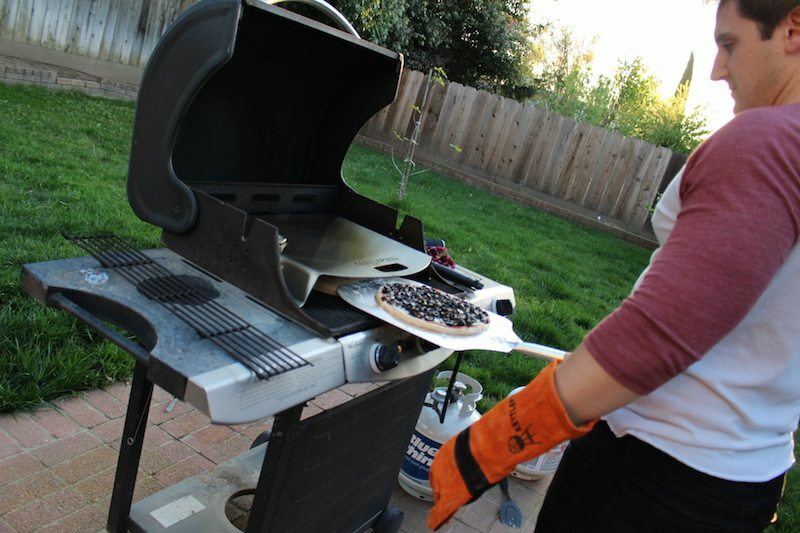 It's super simple to get started making homemade pizza in your backyard. I was literally making pizzas the same day it arrived. In fact, I work from home so when the mailman arrived at around 1PM I had pizzas done within the hour. The simplicity of setting up, baking, and cleaning up is one of the star features of this product. Actually, the hardest part of making pizzas on a gas grill is learning how to make good pizza dough. There's a whole science to it. In theory, it's just water, yeast, flour, salt, and olive oil. But once you dig into the art of pizza making, there's all types of nuanced approaches. Many people let their dough rise for 24 hours, and some people use specialty “type 00” flour. But you don't need all that. I was able to produce great pizza with standard all-purpose flour, dry instant yeast, water, salt, and olive oil. I let the dough rise for about an hour, and baking the pizza itself only takes about 5 minutes. So you can get as deep, or not, as you want into the “art of pizza making”. For a backyard barbecue, I say keep things simple! I was a little upset that on my very first pizza I made a few mistakes, so let me help you avoid them. Heat the pizza stone at the same time as the KettlePizza Gas Pro. It should be hot when you cook your pizza. But other than those simple mistakes, it's very easy to use. I closed the grill top to heat it faster and it was ready to cook in about 10-15 minutes. Pizzas need to cook for just 2-3 minutes, with a turn, then 2-3 minutes, because the back gets hotter than the front of the grill. The temperature and time you cook depends on your preference. I went fast and hot for crispy thin crust. You can go lower and slower if your crust is thicker and you need toppings to cook. Experiment and see what works best for your tastes. Here are some of my creations! 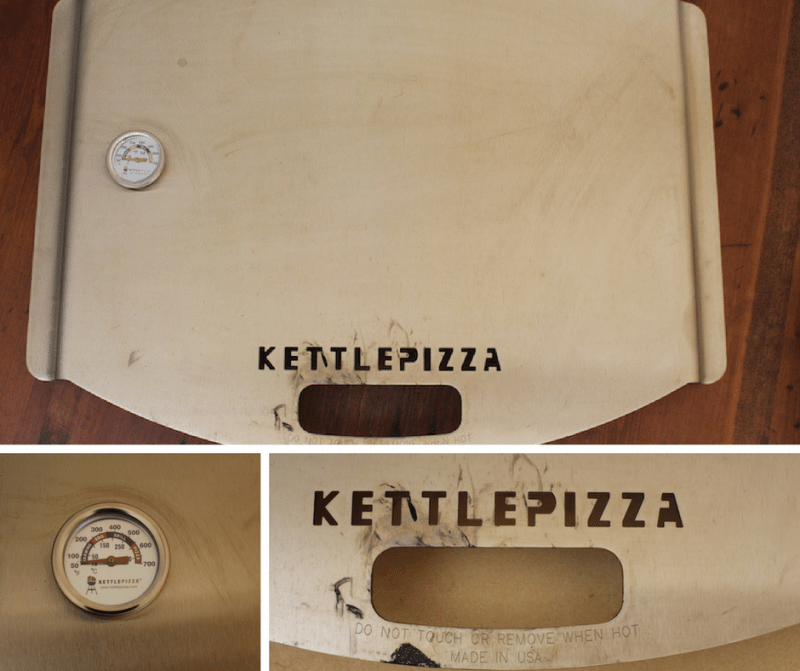 It's very easy to store and clean the KettlePizza Gas because it's made out of very sturdy metal, and there are no moving parts. I was surprised that it was a little heavy because it looks so “minimalistic”. I have no doubt that this product will last a lifetime. You can actually use the KettlePizza to cook other things as well. I don't really see the advantage to cooking steak like this – perhaps a more uniform heating environment instead of super hot bottom and less hot top? But one cool idea I did see on YouTube was grilling garlic bread on top of the metal. I don't feel so bad about spilling cheese on mine now! I suspect that this device reaches temperatures higher than what's listed on the dial (700ºF). The speed that it cooked my pizza was much faster than the other products I tested which claim to reach 750ºF+. I need to get an infrared thermometer gun to accurately test it, but I figured this piece of information was useful for now. I'll update when I get a precise temperature. The back of the device gets the hottest, so be sure to turn your pizza once or twice while cooking. It also helps to sprinkle some flour or cornmeal on the peel as well as the pizza stone (before heating it) to help with preventing sticking. Video: KettlePizza Gas Pro In Action! I've been working with my girlfriend on shooting some professional videos for all these outdoor pizza products I'm testing. The KP Gas was the easiest to work with and the fastest to set up, so it's the first one we did. I plan on doing a voice over one with some insight into the device and cooking pizza with it, as well as some comparison videos. The BakerStone Pizza Oven Box is basically the only other device that directly compares to the KettlePizza Gas Pro. It sits right on top of a 3-burner gas grill, just like the KettlePizza does. It's got a very sleek design, and cooks some awesome pizzas. In comparison, I think it looks “nicer” than the KettlePizza, but it's actually about 1/2 the price. On the downside, it's a lot bulkier which means it'll take up more storage space. The main thing I didn't like about this product is that the pizza stones are not replaceable, or at least not easily replaceable. Perhaps you can order replacements from the company direct, but they are not available on Amazon or other stores. With the KettlePizza Gas, you can simply another pizza stone (that's gas grill approved) if your current stone gets too dirty or breaks. But the BakerStone box was a really good product too, and worth every penny. You can see the full length comparison of KettlePizza Gas VS BakerStone Box, or go to the full BakerStone Pizza Oven Box Review (once I finish it). Though it looks like a similar product, the Camp Chef Italia Artisan Outdoor Pizza Oven Accessory is not exactly the same thing as a KettlePizza. This device also sits on top of a gas grill, but it's made specifically for the Camp Chef brand portable 2-burner (14-inch) or 3-burner (16 inch) gas grills. Notice, it's called an “accessory” because it's meant to be in addition to the Camp Chef grill. One user has commented that they were able to get it to work with their standard 3-burner grill (like mine). However, they had to remove the grill grates to get the temperature hot enough. So yes, it's a possibility, and it's also cheaper than other devices. However, my recommendation would be to go with the BakerStone if price is one of your main criteria for buying a backyard pizza oven. It's only a few dollars more. ..that is, unless, you are buying a pizza oven for a portable gas grill. Then, I would look at the dimensions of your portable gas grill to see if it could support the 16-inch or 14-inch version of the Camp Chef Italia Artisan Outdoor Pizza Oven Accessory. And if you're going camping or tailgating, but don't own a portable grill, you could consider getting the Camp Chef Italia Artisan Pizza Oven (not the accessory). This is a standalone device that hooks up to any portable propane tank. It'll run for a few hours on one of those small green Coleman gas cans! You can set this on the bed of your truck or a picnic table and have a portable gas pizza oven ready to cook pizza on the go. Who Is The KettlePizza Gas Best For? If you want to get the best product to turn your current gas grill into a pizza oven, then this is the product to get. It is my favorite of the outdoor pizza ovens that I've tested so far, and marginally better than the other main product in this category (the BakerStone). For me, the simplicity of the setup, pizza making, cleanup, and storage are the things that really made it stand out. If you are looking for something that works well enough, and want to save money, then go with BakerStone. If you don't have a gas oven, or prefer to get that “smoky” charred flavor from a wood-fired environment, I recommend you check out the KettlePizza Weber grill insert (links to full review). It's the same brand/company that makes this gas accessory, but for weber charcoal “kettle” grills. The flavor is a little better in my opinion, but it does take more work to manage the coal/wood fuel for your fire. Still easier than a regular wood fired oven though! Baking pizzas in your backyard is really fun. 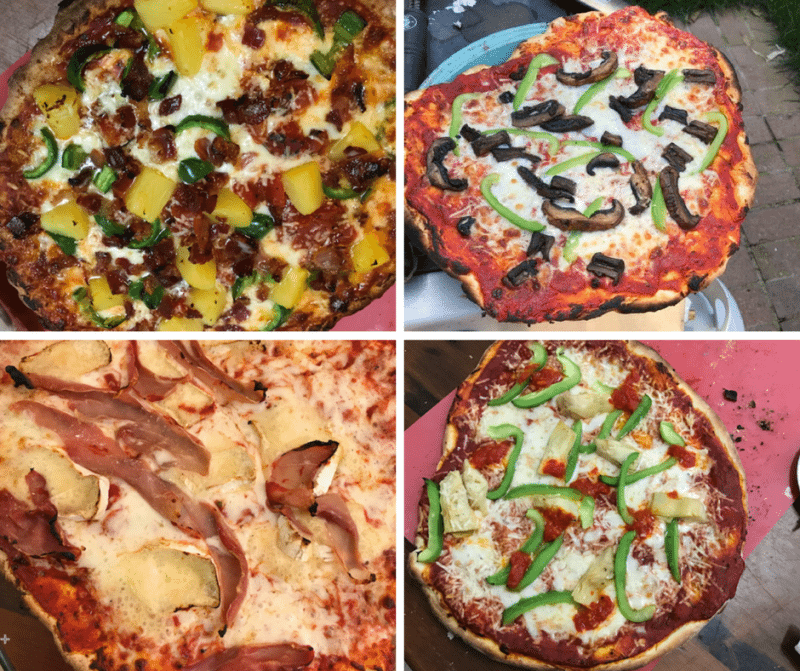 While everyone is grilling the typical steak, pork chops, chicken legs, etc, you can be investing new pizza recipes daily…or just perfecting your favorites. Grilling pizza outside is also great because it doesn't heat up the house, and you can do things in the meantime like play with your dog in the wonderful weather or watch your kids play while you have a beer. There's something special about spending the summer days in your own backyard, and making delicious & creative food just enhances the experience. ==> Get the KettlePizza Gas Pro Here! 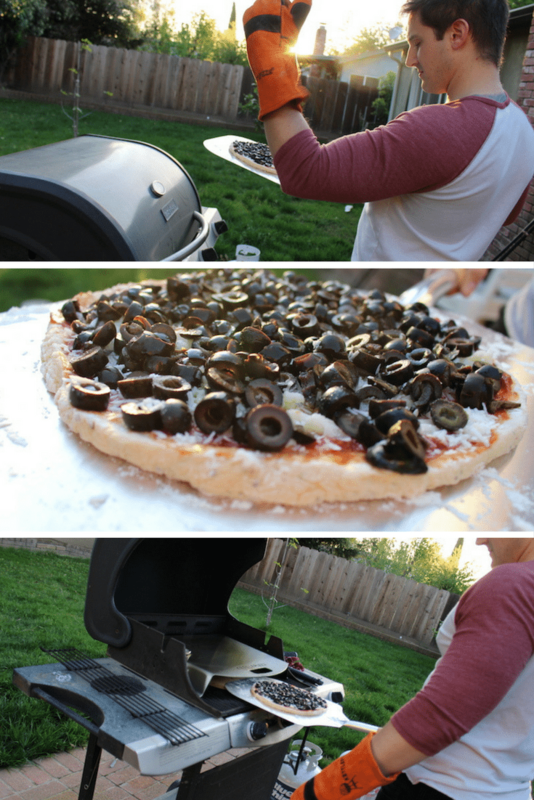 I’m so happy to have come across this post, since we love grilling so much why not pizza? You mentioned some variables for the cooking time depending on the crust. KettlePizza vs the oven box which do you prefer? You recommend a lower heat for thicker crust? Also for the KettlePizza how long will that stone last? It my experience, for thicker crusts, lower and longer works out better. It’s like cooking anything else. If you put a thick piece of meat on the grill and turn the heat way up, it’ll burn on the outside but not cook on the inside. My personal favorite is the KettlePizza, but they are both good! Wow! Grilling pizza? That’s a first! This sounds very interesting. Also, ther photos are amazing. The photos of the pizzas that you made are mouth-watering. However, the price sounds a little much. If I had the money, I would love to buy one of these grills! Do you have any other product reviews similar to this one but lower on the price? If so, please link it to me. I would love to read it! 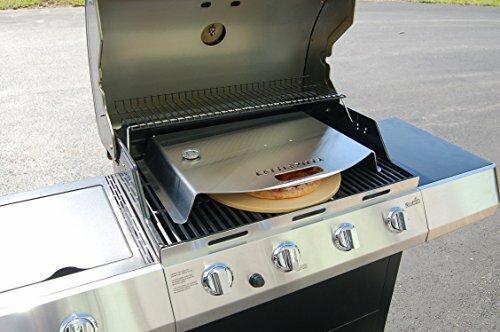 So far, these two items are the only ones that allow you to grill pizza on a gas grill like this, although there are other options if you have a different style grill, like the CampChef one mentioned in the “similar product” section. 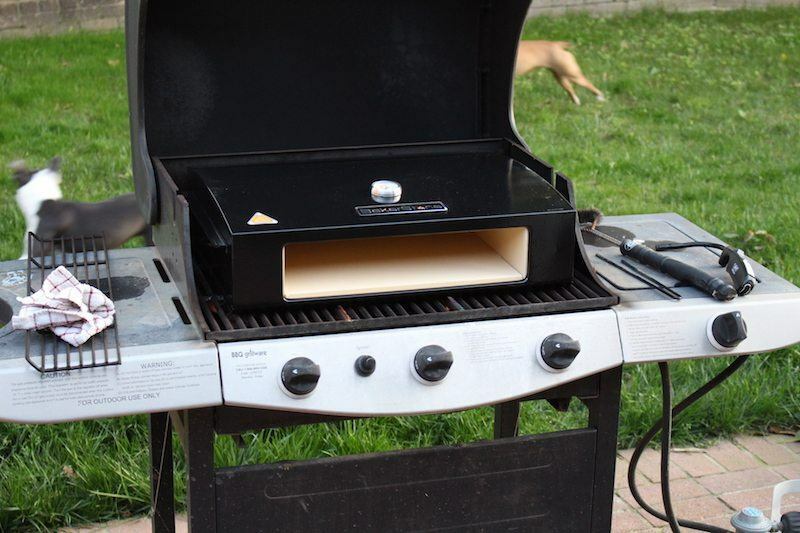 Depending on the style of grill you have, you may be able to pick one up for around $100. But the BakerStone is really only a little more than that. If inexpensive is the route you want to go, then BakerStone is my recommendation! The pizza you make looks so delicious. I practically want to eat it through the computer screen. Alright I am just kidding, but it definitely made me hungry. I mentioned before that I like my food to be cooked fast when you compared the baker stone with kettle pizza. This is why that this pizza grill is still my first choice. You mentioned that baking takes only five minutes. That’s really fast. Usually when I order at the store, it takes at least ten minutes before it is even ready. Well, keep in mind they have to assemble the pizza too! Including dough making, putting toppings on, and waiting for the pizza to cool, you’ve still got to put in more than 5 minutes of work. But the actual making of the pizza is quite fast. Wood-Fired ovens that get up to 1000 degrees can cook pizza in less than 60 seconds! Let me say first that I love pizza! Second, I also love grilling! To me this is a greatest socializing experience with my family and friends. I thought I knew my BBQ and grilling from A to Z. Thanks Nathaniell, I will buy it for sure. Yes, the best part of outdoor grilling is the socializing part. That’s what makes outdoor pizza making so fun. Rather than going in and out of the kitchen while everyone “waits” for the pizza to be done, everyone can be involved and hanging out in the backyard. Even while taking the photos for this review, I was playing with my dog while the grill heated up and the pizza was cooking. I can’t believe that I have never heard about cooking pizza on a barbecue before. Are you sure that you actually cooked those pizzas though because they look like they have been cooked in a pizza oven. I’m not sure you need quite that many olives though! Are these KettlePizza devices available in the UK too? Do you think that you could also cook Calzone on a barbecue or do you think that is a step too far? An absolutely thorough and very informative review of a pizza maker!! And the pics of delicious pizzas made my mouth water for sure. If one is looking for such an oven it surely makes sense to go for this product. The tips provided in the review leaves no doubt that this surely is an excellent product to invest in. Thanks Tushar! Yes, this really is a cool pizza maker. We make our own pizzas all the time at home! Pizza dough is really easy to make. We prefer it to anything we’ve had in a restaurant. I had no idea this item existed and now I’m so excited to invest in one. It looks really easy to use. I’m thinking of how awesome it would be to use in the summer time so that you don’t have to heat up your kitchen using an oven. LOL. I struggled so much to make my first couple balls of pizza dough. It’s funny looking back, but I was very frustrated when it was happening. After so many youtube videos, I couldn’t figure out why my dough was always so hard to knead! They made it look so easy. Turns out, I was not using enough water, so there was too much flour in the mix. That’s why I wasn’t getting the springy, stretchy style pizza dough! Nothing like a great pizza! Add the outdoor ambiance, and we’re talking about one fine day. So, if you were to compare, how would a pizza prepared on a the KettlePizza rate up against of these national pizza chains? Because if I can keep from spending $20 or more every time I order a pizza, then I’ll have to invest in one of these. Lol! It depends on the Pizza chain! Sometimes, it’s nice to not have to put in the work. But put up against Papa Johns, or Domino’s, you just can’t beat homemade Neapolitan pizza. Less grease, more fun toppings, and higher quality ingredients. Plus, the flavor of the dough is amazing compared to the greasy fluff that you get at many pizza chains. Oh my gosh! Now I want pizza! Thanks for the very informative, mouth watering article! I really didn’t know it was possible to create an Artisan Pizza on the grill! My husband and I have been looking forward to one day building our own clay pizza oven, but why wait? Thank you! Going to make pizza now! This is another advantage! If you want to start making pizza this month, you don’t have to build a pizza oven in the next week. Just place an order through Amazon and you can be started within two days (Prime shipping). That’s a whole lot easier than waiting however many weeks it would take to create/buy the plans, get the materials, build the project, season it, and then start making pizzas. Thanks for invitng me to your site ! The review about the kettlepizza gas pro is well done ! I think for the BBQ lover this is an enourmous added value for in the garden ! The children will love this ! You can bake some pizza or even bread while you do not have to leave your spot ! I think even a pie for dessert ! If you have one like these you don’t even use the kitchen anymore in summer time ! Thanks for this in depth review. 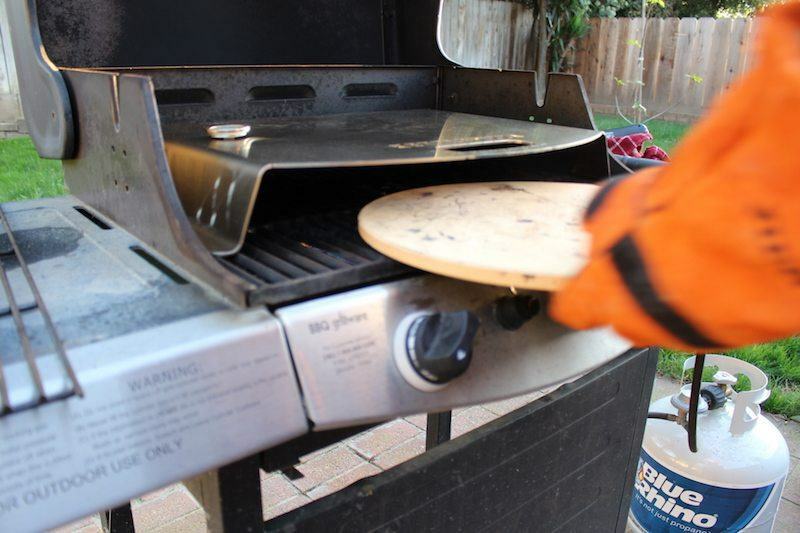 I have been looking for a way to make pizza outdoors on the grill. This accessory, or something similar, looks like what I need to get. I do have a question. I have a weber kettle charcoal grill, and I would like to use that to cook pizzas on. Do you know if this would fit inside of the kettle grill? If not, do you know if they make one that would fit? Good question Jason! This will not fit inside a charcoal grill. To make pizza on a weber grill, I recommend the KettlePizza Charcoal version. Man those pizzas look really good! Lol. I love the fact that you personally one this product and that you give examples and demonstrate the functionality. I am I chef who loves authenticity and fresh food, And you can’t get any fresher and smokier than an outdoor pizza oven. The pictures really sell me on the thought of buying own of these. One word.. PIZZA!! This is absolutely awesome! I’m sure the taste of that pizza is superb, everything tastes better on the grill. I had even grilled fish sticks but i never thought of pizza. Can the Camp Chef Italia Artisan Outdoor Pizza Oven Accessory be used on a regular grill or only gas? I only have charcoal or wood grill. I think the shipping will have an extra charge since im in Mexico but i think it’s worth it. Thank you for showcasing this fabulous piece of equipment. I had already come to your site for those fabulous recipies, and now im in for the hardware. The Camp Chef accessory is only for gas, and only for a specific type of barbecue! It’s definitely not as versatile as the KettlePizza which can be used on any brand of 3-burner gas grill barbecue. Pizza on the grill…you are speaking my love language! I had no idea this kind of product existed. This is such a fun idea for entertaining during the summer. A great way to have a pizza party without heating up the house! 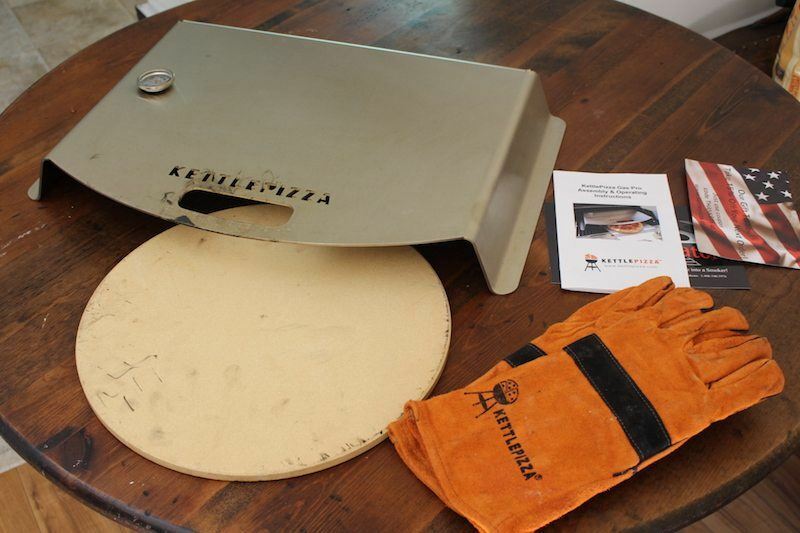 You have given a very thorough review of the KettlePizza Gas Pro and I can’t wait to try it out for myself. Do you think this could hold two smaller pizzas instead of just one? I do not think you could make two pizzas on this unless you got a rectangle pizza stone and made them pretty small! I can see that my summer grill items are coming together nicely after reading this report. This is what i call a working review because i am not only reading it, i am also seeing what it does and how the product actually works. Again well done here and must kudos to you. The pizzas turns out quit nicely though and i have no idea how simple this can be until i red this review. I will surely be adding that to my basket in lieu of summer time. I love seeing different methods for cooking normal foods. This pizza idea is pretty awesome. You should totally consider doing a review on pie irons. They are typically used for camping but I have cooked several different things on the BBQ and had great results. Thanks for sharing, I wish you good luck in your future BBQ pizza cooking endeavors! WOOO this is so fun! What a creative way to make a yummy pizza and entertain the guests! TO me the biggest issue with outdoor barbeques is usually – they are complicated. Kettle pizza looks simple and hey, who doesn’t like pizza, right? haha! Loved this review, very detailed and fun to read. Wonderful information and just in time for the season. 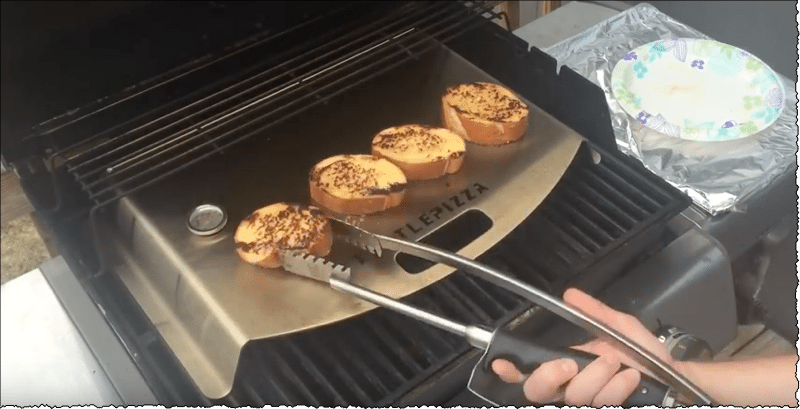 The Kettle Pizza Grill Pro is a great idea! I have never heard of it before reading your review. Your video and pictures are amazing. I like pizza that is thick. Do you have any recommendations on a product that will allow for a thicker pizza – more of a Sicilian style? We generally cut the pizza into slices and use a dipping sauce with ours. Real nice post on the Kettle Pizza and definitely a good product to have. When it comes to grilling outside, I would always think BBQ, but I never thought of using a Kettle Pizza Gas to make my pizza. I usually bake my pizza with my oven, but I bet the kettle gas is definitely more effective and bakes the pizza very good. I will have to add this to my bucket list and good website. Hi Nathaniell thank you for the review you did a good job with all the details, I just wondered if the kettlepizza is heavy since the material is stainless steel so maybe that can make it hard for storage in high places. Otherwise I think is a great option to make pizzas in your yard. Hello, Nathaniell. Wow, what a great website. I really enjoyed your article. I have never heard of the Kettle Pizza till now. I loved your video especially the part where your dog is jumping trying to get at the dough. The images were also great. I am definitely going to bookmark this site and will be telling my friends about this. Have a wonderful day! Such a great article! The kettlepizza seems a great idea now bbq season is just around the corner. You make it look so easy to use. I can’t wait to get one and start trying out my bbq pizza culinary skills! thanks for sharing this fab post i really enjoyed the read. Yes, barbecue season is just around the corner and I can’t wait to get started! I saw the pizza box stone and I think I actually like this one better! Love the idea of cooking on top of it and your pizzas look delish. Now debating which would be a better father’s day gift! This one seems just a little simpler than the box, the price is a little high though. Gives me something to think about!! Uhm…what?! You can grill pizza?! Where has this article been all my life?! When I think summer, I think barbecues and fire pits at the in-laws. They’re all chowing down on meats I don’t eat…and I could be having some grilled pizza! You’ve done a very thorough review, and I’ll be passing it along to the in-laws (*ahem…hint hint ;)). 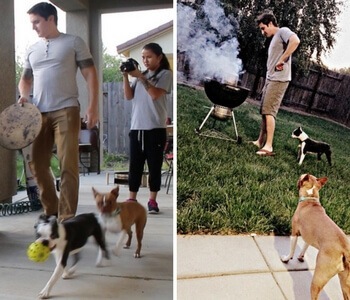 They’re the ones with the grill and nice backyard.) Did I miss your facebook share button? I love pizza and now I’m hungry. This is a great idea. I never knew you could make pizza on a grill, thought it had to be a special concrete oven. The review is thorough and the video is funny. The price is very reasonable for the product. We will have to purchase this when we purchase the new grill. Thanks so much. Me would love to get this bad boy out on my deck this summer for some pizza and root beers on the water, I’m a Grillman. It does seem very sleek and easy to use. I am so curious to taste what grilled pizza must taste like now. My sauce boy is perfect for this grill. I LOVE PIZZA! I never thought ot grill a pizza on a BBQ though. My wife and I love to cook and typically cook our pizza in the oven but I like this idea. I think I am going to have to clean up the grill and cook me some pizza. one of the things I was not sure of was the dimensions of the Kettlepizza cooker? Thanks. Woah, that’s a lot of olives on that pizza! Not really my thing personally; I like to drench it in cheese and pepperoni, maybe some bacon and jalopenos for spice. Anyway, thank you for this review! I’ve been mainly sticking to conventional ovens when cooking home made pizzas, but I can only imagine how much more rich and authentic the pizza would taste on a grill like this. I’ll have to look into getting one of these.